Originally built in 1864, the 70ft Essex smack Pioneer fell into decay after a life spent dredging oysters in the North Sea. 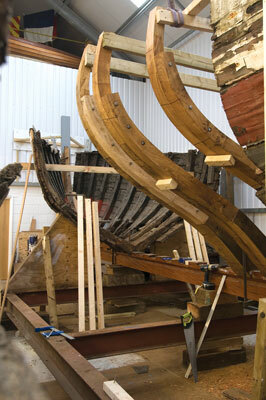 In 1998 an audacious restoration project by the Pioneer Sailing Trust recovered the wreck and restored her. Pioneer's new life is as a sail training vessel. She can take up to 16 people and is used as a means to facilitate learning skills and explore new and adventurous territory while in a unique environment. 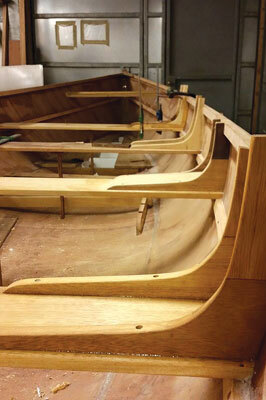 The Trust has also maintained the boat-building ethos by developing a specialist training facility at Harker's Yard at Brightlingsea in Essex where apprentices learn boat-building skills and develop essential values needed to seek future employment. Hundreds of young people benefit from their time at Pioneer Sailing Trust each year, whether on a sailing adventure, work experience in the boat yard, or an apprenticeship. The Trust is passionate about developing and supporting young people through education and new experiences. Once it became apparent the complex restoration of Pioneer was possible, the decision was made to set up Pioneer Sailing Trust in 1999. The Trust, whose founder trustees were Mary Falk, Charles Harker and Rupert Marks, is a registered charity. From day one, practical help and funding has arrived in generous measure from many individuals, organisations and local businesses. Pioneer's new purpose is to give young people the challenge of sailing, which often proves to be a life-changing experience. Pioneer has accommodation for three qualified crew and 12 trainees. As a powerful and strong sea-going vessel, she is ideally suited for day sailing or passage work in the Thames Estuary, across the North Sea or the English Channel. Being a crew member highlights and emphasises many vital qualities essential in life and the Trust believes these practical and new experiences help develop young people. The Trust also opened Harker's Yard in 2009 to further its work with training and education in the marine industry and provided opportunities for work experience and apprenticeships in marine engineering and boat building and repair. Pioneer Sailing Trust works closely with life-development trusts, training agencies, councils, social services and other organisations devoted to improving the life prospects of young people, many of whom are coping with difficult circumstances. Young people often find time at the Trust opens new windows of opportunity. The story of Pioneer is a long one and she is unique in being the very last of the larger size Essex smacks to survive, although only the bottom and other parts of her structure were salvaged as a basis for the ambitious reconstruction. To give scale to the vessel; her present dimensions are 64ft registered length - about 71ft overall length - and about 15ft beam. Originally she was somewhat shorter, but like many contemporaries she was lengthened and altered slightly in breath to suit changing fishery conditions some years after her launch. To understand the background of Pioneer and her contemporaries, we must go back to the Essex fisheries in the mid-19th century, a time of great activity and development when everyday existence at the small towns and villages on the Colne and Blackwater rivers, with their common estuary in North East Essex, depended on fishing, professional yachting, shipbuilding and other maritime activities. At the time, there were approximately 250 smacks under sail, working from the Colne alone. They would have been manned by about 1,000 hands. Pioneer was built by Peter Harris at the maritime village of Rowhedge in the parish of East Donyland on the upper reaches of the river Colne. It has deep water by its quays and was home for many mariners and shipbuilders after the 1780s of large numbers of professional captains and hands for yachts of all sizes and types, many of whom found something of a winter living fishing in the 50 or so smacks owned there. Pioneer continued to sail from Brightlingsea and by 1919 Joseph Eagle, one of an old local fishing family, was managing owner. The trade slumps of the early 1920s bought further change of ownership and eventually she was laid up and became a houseboat at East Mersea, later being towed round to West Mersea on the nearby river Blackwater where she was moored on the mud. It was not until 1998 that she was rescued from the mud and brought back to sailing condition by Pioneer Sailing Trust. In the dying days of 1998, in a bitter December wind, Pioneer was raised from the mud and floated to Wyatt's Hard, West Mersea. From there she was transported to a temporary home at Goldhanger where she was carefully cleaned, blocked up, shored and plumbed. A three-dimensional digital survey by laser assured the accuracy of her recorded lines. Finally laid up in a barn at Great Totham her restoration began. In 2003, she emerged, restored, drawn across the waterlogged fields by five tractors, on her low loader artic, to the hard Colchester road. Manoeuvred overnight by the narrowest of margins past Colchester Castle she eventually arrived back at Brightlingsea. On 17 May, 2003, she was re-launched bearing her original Colchester registration CK18. She was, and is, the pride of Essex and the UK’s great maritime tradition. Since the restoration and launch of Pioneer, The Pioneer Sailing Trust has developed Harker's Yard on the Shipyard Estate, Brightlingsea, with the aim of benefitting and developing the local area's marine industry through training. Harker’s Yard is a purpose-built training facility that provides work experience and apprenticeships for young people wishing to enter the marine industry. Along with a base for Pioneer during the winter months, it also provides a quay and fuel barge facility for working vessels. 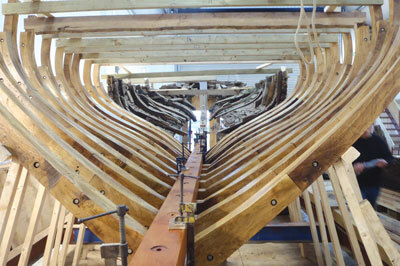 The yard specialises in training apprentices in the restoration of historic vessels and the manufacture of the East Coast Rowing Gig, as part of the expansion of coastal rowing. 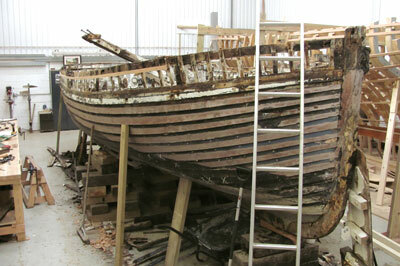 Recent projects include major restoration on the 19th-century yacht Volante. It was designed and built in Wivenhoe in 1870 by John Harvey. The 1897 gentleman's yacht Rainbow was also recently restored as well as John Constable’s vessel. 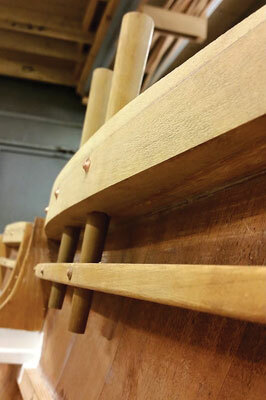 Additionally, the East Coast Rowing Gigs are at various stages of production. These cold-moulded rowing gigs are designed to be rowed by four oarsmen and a cox in coastal waters. The Trust hopes coastal community rowing using such gigs will allow people of all ages and backgrounds to get on the water. The Trinity House Launch and Priscilla are part of a wider three-year project and are financed by the Heritage Lottery fund. 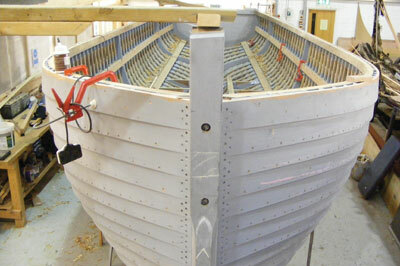 The apprentices work alongside shipwrights to learn and develop woodwork skills. The hope is the traditional skills will be transferred and conserved for the future. 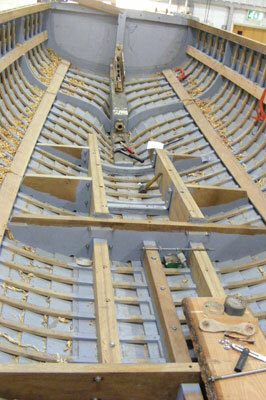 While most of the projects in the yard are centred on traditional wooden boats, apprentices are also given the opportunity to work using up-to-date techniques, which equip them with relevant stills needed for modern marine industries. The apprentices work towards the Apprenticeship in Marine Engineering, comprising a NVQ level 3 qualification in Marine Engineering and City and Guilds 2451 course in yacht building and repairs. The apprenticeship programme lasts approximately 24 months and provides apprentices with the valuable knowledge they need to carry out safe practice at work, understand the marine industry and ultimately make them more employable. The apprentices are also encouraged to sail aboard Pioneer in the summer. Sailing is a valuable experience for them and the hope is that it will reinforce their passion for boats and the water. 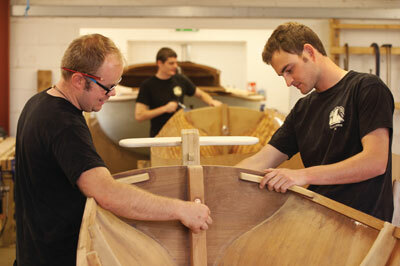 Through the combined experience of boat work, theory and sailing, Pioneer gives the apprentices an enriched and unique experience which they can take with them into their next steps in life. Pioneer and its crew, along with five new apprentices, embarked on another voyage to Terschelling, northern Netherlands, where the boat was originally used to dredge for oysters in the 1800s. They were certainly put through their paces as they took it in turns to helm, navigate, trim sails and cook. The crew were split into four watches and rotated shifts every four hours. Taking only 30 hours, the outward journey ran very smoothly. The next day, after a good rest, the crew hired bikes and set off to explore Terschelling. The first place they visited was the Wreck Museum. This museum is an Aladdin’s cave of treasures, old and new, from WW2 artifacts to trainers washed up from container ships. The next stop was something a little more exciting for the apprentices, going blow carting! They had to cycle to the beach, which lends itself perfectly to this sport as the area is flat and wide. It was a great sport to try, so everyone took part. As it was windy, they managed to get up to some impressive speeds... and impressive tumbles! When the bikes were packed away and everyone was back on the boat, the day seemed over all too quickly. Once on board, however, the skipper, Jim, informed them that bad weather was approaching and they needed to leave in the morning. If not, they might be stuck there for another week. Some of the apprentices thought this did not sound like a bad idea! Setting out for another journey across the North Sea, Pioneer left Terschelling at about 9am the next morning. All the sails went up as the conditions were calm. They were making good progress. But as they approached the shipping channels the conditions became more challenging. Pioneer seemed to thrive, however, and sailed like she knew her way home. Steadily, the sea state worsened but Pioneer was in her element, powering through the waves. The sails needed to be reefed, making it a little easier to handle; at some points the bow sprit was going under every other wave and there were a few big ones over the bow. For the well-trained crew, handling the boat was no problem. The rocky waves made it all the more exciting for the crew as the boat felt sturdy and strong in the challenging conditions. It reminded them what Pioneer was built for... and they loved it. The watch systems were altered from a four-watch system to a three which meant that more people could be up on deck to help. As Pioneer approached the UK, more technical skills were required as the crew had to tack frequently. Everyone had to be alert for this, especially in the dark. 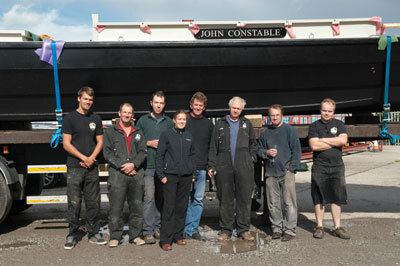 The crew all pulled together as a team, making the boat run smoothly and safely. Pioneer was soon approaching home. The shorter chop of the waves meant the momentum of the boat was changing, more waves were coming over the bow. The decision was made to get shelter in Pin Mill, Suffolk, where they knew they could anchor safely. As the boat slowed down and the engine was turned on, the excitement died down as everyone realised how tired they were. The anchorage was a welcome sight and Pioneer settled down for the night... waiting for the next adventure. Pick up the latest copy of our brand new magazine today!